It is a city where the sound of bombs is part of growing up, recently becoming the epicentre of the violence that plagues Afghanistan. In western Kabul, however, a big blue bus is bringing joy to some of the capital’s younger generation. Children emerge from alleys and houses, surrounding the vehicle and cheering its arrival, though a few watch cautiously given their fear of the unknown. All that the bus contains, however, is books. 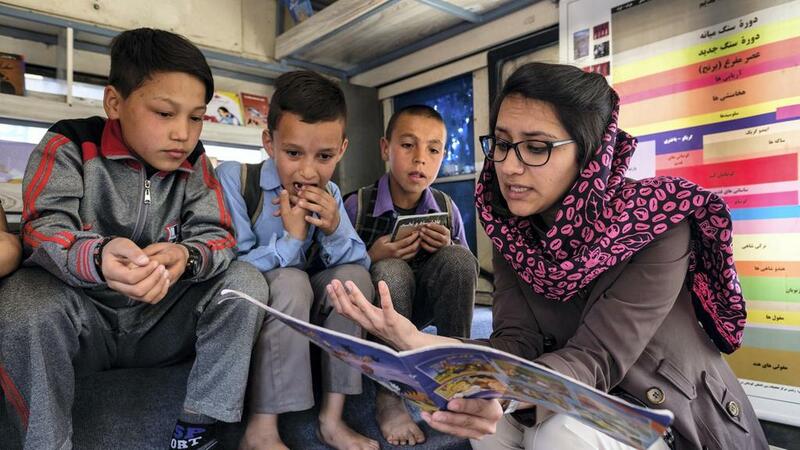 “Dear children, this is a library on wheels; we have lots of books and stories for you,” Freshta Karim, an Afghan woman and founder of Charmaghz, tells them. The name, which means walnut in Dari, one of Afghanistan’s national languages, has special resonance as it represents the brain in local culture. “It equates to logic. We are trying to promote critical thinking,” Ms Karim explains. Nearly 17 years after the overthrow of the Taliban government, which outlawed women’s education, the United Nations says only 31 percent of Afghans are literate. The rate is almost twice as bad – 17 percent – among women. An estimated 3.5 million Afghan children have never gone to school and 75 percent are girls.